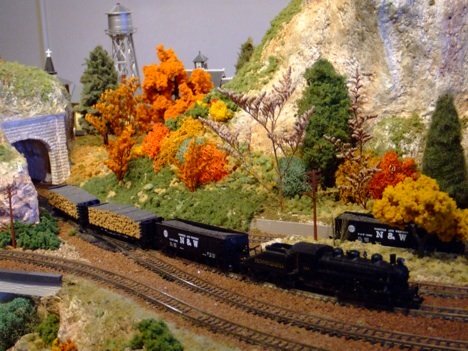 Model Railroad Layout: an all inclusive way to show your trains in their "natural" environment which may include mountains, prairies, rivers, cities and small towns. A layout will demonstrate how your trains interact with various industries. There will usually be some type of theme for each layout to show some particular type of service(s) that your railroad provides - like logging, coal, passenger service, etc. Also there will usually be an attempt to display the railroad existing within a certain area of the world and within a particular era. Your layout may be as large or as small as you wish based on your own space, time and monetary constraints. You may want to have a small shelf switching-type layout, point to point, or a large basement or attic-sized empire with multiple continuously running trains in a loop to loop fashion with lots of side branches, junctions, bridges, multiple industries , ports or cities. Sometimes, smaller is better because you can devote more time to perfecting it and making it into something you can really be proud of. The more friends you have that are interested in helping you with your layout (in exchange for cookies and ice cream), the larger layout you all can have and share. A prototypical layout will try to duplicate as many facets of the real railroad (e.g.,Norfolk and Western) as possible within a certain known length of track (e.g., Roanoke to Richmond) and within a certain period of time (e.g., November of 1948). This, of course, requires a certain amount of research and acquired knowledge about the particular railroad you are trying to model. There are many available resources to easily obtain this information if you are so inclined. One of the most exciting ways to do this is to take a trip to the area you are modeling and gather as much first-hand knowledge as you can, including pictures, measurements of structures (if they still exist). etc. Most cities have fantastic train museums where you can obtain a lot of history about the railroad you wish to model. A freelanced model railroad will be created solely from the imagination of the builder, but the design should always define some sense of realism regarding how a railroad operates and the general era and area in which it is operating. However the names on the locos and the cars as well as the track plan and the towns through which the railroad runs can be entirely made up. A small switching layout might be right up your alley. This wouldn't require much room at all and many of these designs can be very interesting and intriguing. You can even create some unique switching "puzzles", to challenge the operator to get a freight car from one branch track to another without touching it. Many different industries would be conducive to being modeled on this kind of layout. A good reference book on this is How To Design A Small Switching Layout by Lance Mindheim. Another very interesting type of model train display is to create a theatrical type stage for your trains to enter into or exit from each side. The only visible part of the layout is the front. The staging yards are either hidden on the sides by curtains and/or looped around behind a backdrop. You may elect to create a small module that you can bring to a model train show or exhibit that will fit into a much larger layout constructed by putting lots of other modules together. This is the way a lot of model railroad clubs like to develop their model train displays. Each module has to be a certain size and the tracks have to reach the edges of the module a certain way such that the edges of your module will match up to the edges of the other modules. These standards are defined by the NMRA (National Model Railroad Association). A great reference for building modules is Modular Railroading Handbook (Volume 1) by Jim Spavins, or an earlier book by the same author - Module Design Ideas (Volume 1) . A small diorama is a much smaller type of model train display that may be the perfect way for you to get started in the hobby. This could be done on a 1 or 2 by 3 foot piece of plywood or even smaller, depicting a railroad scene complete with train, track, terrain, scenery, structure, people, and even a pond or creek, etc. - a 3D work of art that you could place in your living room or even sell at a craft show or train show if you like. A reference for model railroad dioramas is Scenery for Model Railroads, Dioramas & Miniatures: With 25 Handy Tear-Out Reference Cards by Robert Schleicher. Garden railroads, usually done in G or O scale, are very popular in many parts of the world where the weather is mild and conducive to many months of outdoor activity each year. They can even be done in harsher climates but probably for shorter periods of time each year. Just like indoor layouts, these model train displays can be fairly expansive. They add a new dimension to the hobby in that you can use real plants for your vegetation and scenery. The landscaping is a major emphasis, and incorporating an operating railroad amidst this landscaping is an exciting concept. Here is a good place to start... Garden Railroading: Getting Started in the Hobby by Kent Johnson. If you like photography, you could have multiple "model train displays" consisting of interesting photos you've taken of model trains or railroad equipment. You could build a small railroad scene and take pictures of it from different angles. You'd be surprised at how many photos you can take of the same small scene that are so different in size, angle and perspective that if one is just looking at the pictures, he/she may get the idea that you either have a large layout or you've take photos of many different layouts. You can use these pictures to frame and sell or even enter various model railroad photography contests. An older but still valuable book on model railroad photography is A Treasury of Model Railroad Photos: Four Creative Approaches to Model Railroad Photography by Dave Frary and others. From "Model Train Displays" to "Basics"
From "Model Train Displays" to "Homepage"